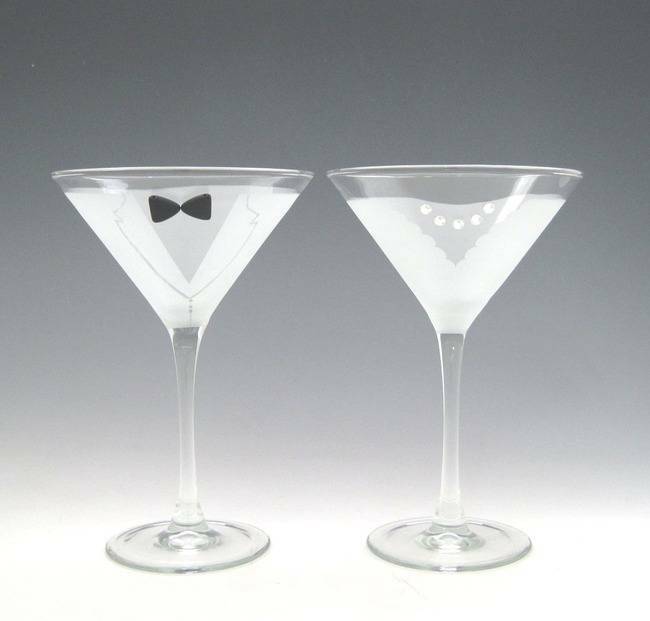 These Bride & Groom martini-style champagne toasting glasses from Asta Glass are the greatest. They are distinctive and special, but also have a classic look that's tasteful with any wedding motif. Make a real statement at your festivities with these special his and her retro style glasses. Her scalloped-neck dress is permanently frosted onto the glass and is set off by a sparkling necklace made of Swarovski crystals. His Armani-inspired tux is also permanently frosted onto the glass, and his bow tie is made of black art glass. Sweet and romantic, these handcrafted martini glasses are a lovely way to toast the perfect day or ring in the New Year. These toasting glasses are the perfect wedding gift for yourself or that special couple. They also make a great Valentine's Day gift for your special someone.